“We are so happy to be partners with the CSO for LUMENOCITY, and we’re thrilled, again, to be able share with our community the biggest artistic and musical spectacle of the year in our city. We eagerly invite all of our neighbors who were able to watch it live during the summer to relive this wonderful event. And for those who were not able to see it the first time, get ready for a great show,” CET Executive Producer Mark Lammers said. “LUMENOCITY is the perfect confluence of our city’s history and our city’s musical and performing arts pedigree. We have a heritage of coming together to celebrate and appreciate these things time and again, and we’re just so happy to share the experience once again with the community, especially during the holidays,” he added. The LUMENOCITY 2014program on CET will include the Pops, conducted by John Morris Russell, performing “Birdland,” “Mancini Joy,” “Make Our Garden Grow” with the May Festival Chorus and soloists from the Cincinnati Opera as well as “Happy” with dance groups from around town. The second half of the show will include all five works performed by the CSO under Music Director Louis Langrée including Copland’s “Fanfare for the Common Man,” John Adams’ “Short Ride in a Fast Machine,” the fourth movement of Tchaikovsky’s Fifth Symphony, Elgar’s “Nimrod” from Enigma Variations and Borodin’s “Polovtsian Dances” along with the light-show by Cincinnati’s own Brave Berlin. 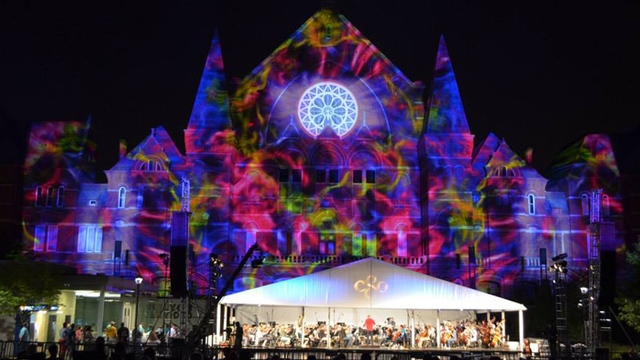 LUMENOCITY was broadcast live on CET as well as streamed online during the event in August. This is the first televised rebroadcast following the event. “LUMENOCITY 2014 was nothing short of inspiring. We are thrilled that the community has the opportunity to re-experience this groundbreaking event through CET. We’re especially excited about the brand-new documentary, which will shed light on the incredible vision and creativity that makes LUMENOCITY come to life,” CSO President Trey Devey said. Making Magic: LUMENOCITY 2014 focuses on how the creative teams at the CSO and Brave Berlin conceived and storyboarded LUMENOCITY. The challenge was clear: Make this year’s event more spectacular in every way. LUMENOCITY 2014: Making Magic is a behind the scenes look at the creative work that had to happen before the first photon of light illuminated Music Hall. “Seeing the concert live is one thing, but now we’re going to take you behind the scenes. We’re going to pull back that curtain and show you what it actually takes to bring the music, the visuals, and the artistic vision together in order to produce this amazing event. It’s illuminating,” Lammers said. For more information about CET, CET Arts and our local productions, visit www.CETconnect.org. The Cincinnati Symphony Orchestra is a dynamic ensemble of some of the world’s finest musicians. The fifth oldest symphony orchestra in the U.S. and the oldest orchestra in Ohio, the CSO has played a leading role in the cultural life of Greater Cincinnati and the Midwest since its founding in 1895. The CSO has built a reputation as one of the world’s foremost orchestras, determined for greatness and heralded as a place of experimentation. This was on full display during LUMENOCITY®, a spectacular concert of live music combined with stunning images projected on the façade of Music Hall. This event in August of 2013 and 2014 garnered international attention and drew tens of thousands of people. The Cincinnati Symphony and Pops Orchestra is Cincinnati’s ambassador with over 10 million units sold, many of which have received Grammy awards and nominations. the Orchestra also performs as the Cincinnati Pops under the direction of John Morris Russell, and the CSO is the official orchestra for the Cincinnati May Festival, Cincinnati Opera, Cincinnati Ballet and the World Piano Competition. The CSO is Cincinnati’s own and committed to enhancing and expanding music education for the children of Greater Cincinnati and works to bring music education, in its many different forms, to as broad a public as possible. Education and outreach programs currently serve more than 75,000 individuals annually.